Why do the Amish practice shunning? Shunning is a practice fundamental to Amish identity. Shunning, or Meidung, was one of the reasons Amish Christianity came about, and has been seen as critical to maintaining the integrity of the Amish church. Shunning is often considered harsh by outsiders, and often misunderstood by non-Amish as well as some Amish themselves. Social shunning occurs when an individual has violated the Ordnung (guidelines for daily living) and has been excommunicated from the Amish church (also know as being in the Bann). Shunning is a form of social avoidance. It is an alteration of behavior towards an individual who has willfully violated rules of the church. Shunning may take the form of eating separately, not doing business with a person, not accepting gifts or rides from a shunned individual, and generally excluding a person from community activities. Amish will still converse with an individual in the Bann, and will offer assistance if needed. But for all intents and purposes, that individual, through his own choice, is considered outside the flock. Why do Amish practice shunning? Amish practice shunning as a means of enforcing an individual’s commitment to God, made along with the Amish congregation. Amish see a Biblical basis for shunning. Passages often cited in support of shunning include Matthew 18; 2 Thessalonians 3:14 (“And if any man obey not our word by this epistle, note that man, and have no company with him, that he may be ashamed”); 1 Timothy 5 (…”Lay hands suddenly on no man, neither be partaker of other men’s sins: keep thyself pure”…); 2 Corinthians 13:10 (“Therefore I write these things being absent, lest being present I should use sharpness, according to the power which the Lord hath given me to edification, and not to destruction”); and numerous others. Amish practice shunning out of “tough love” in order to get a deviant person to see the error in his ways, change behavior, and re-affirm his commitment to the church. Without rules and shunning, the integrity of the Amish church would rapidly disintegrate. “Shunning” as practiced today could perhaps be best described as a ritualistic reminder of having gone astray and having broken your commitment to the Lord Jesus and the body of believers you made your commitment and baptismal promise with. Notice I said ‘with’ as opposed to ‘to’. It is also a statement that the rest of the flock has no intention of leaving the fold and that it takes its commitment to the Lord and each other seriously. But most of all it is done so the soul of the deviant may be saved on the day of Judgement. As this Amishman explains, shunning is done out of concern for the deviant member. Shunning is also done to protect the body of the church. Shunning in some ways is a fence that keeps the wolves away from the flock. Amish often point out that an individual can’t sit on the fence. Were Amish to accept any practice or belief that came along, the body of the church would be in danger of being corrupted and members led astray spiritually. Membership in the Amish church would be meaningless. 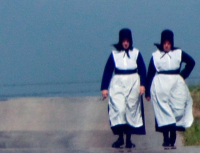 When do Amish employ shunning? Amish place an individual in the Bann and employ shunning as a last resort. Typically, church leadership will first visit an individual to discuss the issue at hand, often a violation of the Ordnung, such as use or ownership of a forbidden technology, or otherwise universally recognized sinful behavior. The aim is to bring about a change of heart and get the individual to cease his errant behavior. In some cases, such efforts are effective. The individual will either make a confession to the bishop, or in front of the church itself, and be placed in a temporary (usually lasting a few weeks, can be as many as 6 weeks) period of excommunication. After this period, all is restored, and the deviant behavior forgiven and forgotten. But if an individual deliberately flaunts church rules, refuses to change behavior, to “put away” a forbidden technology, or otherwise continues down a sinful path without regret and attempt to change, the bishop will move to excommunicate him or her (also known as being in the Bann). Amish researchers Hurst and McConnell note that in the Holmes County community, even those who refuse to confess will receive a “grace period” of six to twelve months during which members attempt to persuade the disobedient member to change behavior. Later, there is a vote by the members on excommunication, which must be unanimous (An Amish Paradox, Hurst and McConnell). As alluded to above, excommunication is done as a last resort and with much remorse on the part of the church body. As the Amishman, himself twice placed in the Bann, explains, “shunning is usually done with great reluctance and only once there is nothing else left to do”. How long does shunning last? As described above, Amish may be placed in the Bann temporarily for minor transgressions for which they show remorse and ask forgiveness. Otherwise, excommunication is for life. At the same time, the Amish always allow the possibility of return, confession, and reinstatement into the church. Though this is not too common once an individual leaves, when it does happen, it is cause for much joy in a church. “Upon repentance the relationship is restored and what is in the past stays in the past,” notes the Amishman. 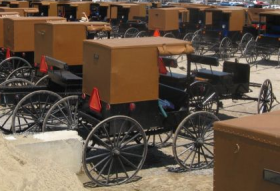 Different Amish groups take different approaches to shunning. There remains disagreement among Amish today as to how shunning should be applied, echoing the original issue which led Jakob Amman to break away from the Mennonites and form the Amish branch in the late 17th century. Some Amish, such as those in Lancaster County, and in more conservative affiliations, follow what is called strong shunning, or streng Meidung. In this form of shunning, an individual will be subject to Meidung for life, unless he or she returns to an Amish church (in some cases, his original church) and makes a confession. In the milder form of shunning, practiced by numerous Amish communities in the Midwest, the Bann will be lifted if the individual joins a related Anabaptist-umbrella church, such as a Beachy Amish or more progressive Mennonite church (as often happens with individuals who leave the Amish). Individual Amish may vary in their approach to shunning as well. Amish-born scholar John A. Hostetler notes that some Amish dislike the practice of shunning and may only perform it symbolically. What other groups practice shunning? As shunning is a concept with Biblical basis, other groups have practiced it in the past, and some still do today. The Catholic Church excommunicates members though social avoidance is not practiced. Other Anabaptist groups, (particularly Plain churches) such as Mennonites and Hutterites, also practice forms of shunning. Shunning is seen in some other Christian groups including Jehovah’s Witnesses. There is a history of shunning in Judaism as well, though the practice has largely ceased. Shunning is controversial and often seen as harsh by outsiders. One serious criticism of Amish groups is for using internal church discipline to handle infractions that are in fact serious violations of the law. In 2009 Amish in Missouri drew criticism and faced charges for failing report child abuse in their community. At the same time, not all Amish would take this approach, and do report actual crimes when they occur. Another criticism is that individuals involved may make the human mistake of taking things too far. In some cases, Amish bishops may wield church authority in a heavy-handed or overly authoritarian manner. Some accuse Amish of being overly legalistic in their application of shunning and missing the point of Scripture. When ministerial authority is exploited, such criticisms can appear justified. As bishops are subject to human weaknesses, it is true that sometimes church discipline may be taken to an extreme. Despite the criticisms, Amish maintain that shunning is meant to be done out of love. Shunning is a key element upholding the integrity and fabric of Amish life, lending strength to the Amish church and undergirding a strong community based on Christian principles. 18 responses to Why do the Amish practice shunning? I watched ” The Shunning” on HALLMARK channel. It was very sad. Does it have any truth in it? Can you really be shunned and still live in the same home as other Amish? I believe according to the bible only God has the right to punish the sinners and is not given to man. Shunning is org crimminal activity that members of org group are gathered together …. Judge someone accounce shunning to inflict spiritual death and human death upon them . It is illegal for street gangs and folks gathering claiming amenity to the law claiming they are a Church..
Hans, it is true that you can live in the same home. Sometimes it occurs between spouses. Shunning is practiced differently in different Amish groups though. I have not seen the film though so cannot comment on the rest of it. I’ve heard the Amish forbid any music. Not sure if this is just in church or at all times but I’d be interested in knowing this. Would a Swiss Amish person be shunned for marrying an old order person? Could a shunned Swiss Amish person be accepted into the old order church? And if so, how would this be accomplished? Shunning is a practice done by folks whom believe they are God . This practice said it done in love does damage to folks being shunned and that’s what they want. They judge then punish when in the group .. while raising a family you have to be mature enough to teach your kids value, love and acceptance .. if you think your God..and want punish, and cast out into the pits of hell …then your not marmture enough to raise kids ..
What we do know now as a society regarding this primitive abuse done inside these compounds that make up thier own rules after isolating from birth from TV, radios, electric, and are educated according to the education level of the person elected to educate them and that is also filtered. So then they shunn and kick out their own that have been isolated and have no knowledge on how to survive in the world .. with limited education , social skills .. It is irrisponsible on the folks that want to play God multiply and shun. The Amish I do business with seem to be adequately educated. They are certainly better educated than some non-Amish people I deal with. Sheyll, your education seems to have neglected basic grammar and spelling. I’m sure you business with them.. matter of fact you sound very eager to point out the splinter in someone’s without seeing the log in your own.. you obviously are uneducated about the practice of shunning .. which cult were you shunned from??
. I was shunned from the same type of cult. And don’t do business with them or contribute to thier funds . When shunning as I’m sure your well educated they judge kick them out and they aren’t allowed to do business with them. So I don’t contribute to thier businesses, funds, or anything . Your not well educated ..you must be thinking of well fed . This guy claims he dose business and claims to be educated? I question his reading ability . Why would you do buisness with folks whom claim they are godly and practice shunning? One of the shunning rules is they don’t do buisness with the folks they have shunned. So since they have grouped together judged and sentenced them by shunning them. They just sinned and by thier own rules . Nobody should be doing buisness with them. The shunners become the shunned until they become godly . Wow. You just lost all my sympathy. I can’t understand why a cult would shun you — you seem so rational and clearly well educated. Sheesh. Respond if you wish, but I won’t see it. I checked back on this site after not being on here for awhile. Now I am reminded why I took a hiatus. People have freedom to choose which religion or form they wish .. without org groups coming after them or thier kids . I can tell your not from this county ?? And not well educated . Which county are you from?? Or which school were in charge of bulling at??? We all learn in the Bible what Jesus taught .. and what he teach?? He broke up a group of folks that thought they were Godly and threw rocks at a women and wanted kill her .. and he break up??? I leave you to read a study your bible and learn what to shun …like coffee ,, hate of people .. shunning hate thoughts … all the stuff thought as a responsible society .. Try to have a nice day!!? and remember god views all sin the same… we are all Gods Children not just who we pick and choose …. and it appears your an abusive controlling person!!! That reminds me Jesus came and fed the multitudes . He’s God son prince of prince and he fed the multitude. He didn’t say I’m the son of God and you folks aren’t following his ways I’m eating here and you all can’t eat with me. Folks make up and do thier own religious rules..from thier own educated inturputations from the Bible. I’d encourage you to read those verses Sandy and/ or Sheryll. Shunning under which flag ? Look up at the flags flying around in America were people volunteer for service to defend the right of freedom in America. Without volunteering property … which is theaft ..
Or volunteering any thing or families..
Folks that criminally shun .. claiming were God … here’s the verse … God says this I interpret to mean this .. and I am God here’s another verse God says he’s going to this and I’m God here too.. I really incourage you to volunteer looking up laws regarding illegal activites regarding shunning ..
Read on and with humbleness that you aren’t God..
Leave a reply to Why do the Amish practice shunning?